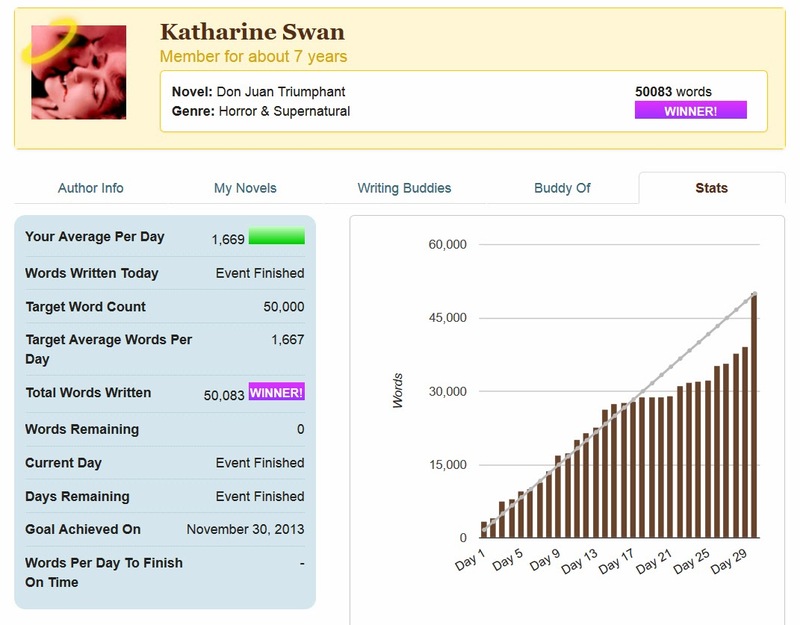 I took a break from my goals posts during November for the sake of doing NaNoWriMo -- and it was a good month! I met my goal, even though I got a little behind and had to do a big day of catchup at the end. You can see that I was nicely on schedule for about the first half of the month, with a little bit of a lead occasionally. About halfway through the month, though, I started lagging behind. The reasons were varied: too many distractions from friends I'd met at write-ins (and we had some wild and crazy write-ins this year), having a busy schedule with not much time to write, and a little bit of indecision on what to do with my novel. Writing 10,000 words on the last day wasn't an ideal way to win NaNoWriMo, but I'm proud that I made it anyway, and also rather pleased with my 10k day. I don't know if I've ever done that before -- I can think of a few 8k days, but I can't remember any as epic as 10k. I'm pretty pleased with that. And, amazingly, all my indecision and hesitations fell away once I had that deadline looming over me. And I just wrote. The one thing I didn't get to do was to finish my novel in November, as I had been planning. Part of it is because I underestimated the word count -- I thought it would be more of a novella, closer to the 50k required to win NaNoWriMo, but it seems it'll be longer than that after all. I've taken a few days off, after my 10k day, but I think sometime in the next couple days (and perhaps today) I will start working on it again. I want to finish the novel, and make a few changes I had in mind for earlier scenes, before I go back to the revisions on my first Ruby Ransome novel. Now that NaNo is over, of course, I have only one month to get some of my goals for the year out of the way: my reading list, for one thing, and the website and blog overhauls I wanted to do. Luckily I will have some time off over Christmas, so hopefully this month will be a productive one!